Peter Returns by Johann Christoph Weigel, 1695. Rhoda is in the upper left of the woodcut. Rhoda (Gk ˁΡόδη) is an individual mentioned once in the New Testament. She appears only in Acts 12:12-15. Rhoda (whose name means "Rose") was a girl (Greek: παιδισκη) living in the house of Mary, the mother of John Mark. Many biblical translations state that she was a 'maid' or 'servant girl'. 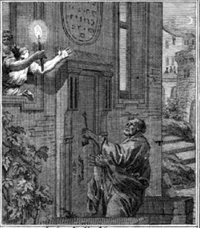 After Peter was miraculously released from prison, he went to the house and knocked on the door. Rhoda came to answer it, and when she heard Peter's voice she was so overjoyed that she rushed to tell the others, and forgot to open the door for him. She told the group of Christians who were praying that Peter was there. They did not believe her at first, and told her she was "out of her mind". When she kept insisting that it was Peter, they said, "It is his angel." Yet Peter kept on knocking, and eventually they opened the door for him. Peter had walked out of a prison chained to, and guarded by, Roman soldiers and confined behind secure walls; yet, was unable to get past a gate because a servant girl was too excited to open it for him. Jaroslav Pelikan suggests that it is "difficult not to smile when reading this little anecdote," while F. F. Bruce says that the scene is "full of vivid humour." John Gill surmised that Rhoda recognized Peter's voice because she had "often heard him preach and converse [with Mary's] family". However, theologians Donald Fay Robinson and Warren M. Smaltz have suggested that the incident involving Rhoda really represents an idealized account of the death of St. Peter, which may have occurred in a Jerusalem prison in 44 AD.